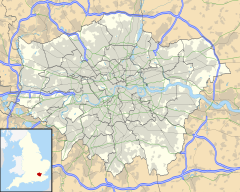 Manor House is an area of North London in the northwest corner of the London Borough of Hackney. It lies immediately east of Finsbury Park, north of Stoke Newington, west of Stamford Hill and Seven Sisters, south of Harringay. The area was originally known as Woodberry Down, but with the arrival of the tube station in 1932, the area began to be known as Manor House. The demolition of the once very fashionable area of Woodberry Down and its replacement with one of London's biggest public housing estates resulted in 'Woodberry Down' being used to refer to the public housing area and 'Manor House' for the area beyond. With the regeneration of the Woodberry Down Estate during the early part of the 21st Century, much of the area, rather than just the housing estate, is now being referred to once again by its nineteenth-century name of 'Woodberry Down'. Built up during the middle part of the nineteenth century as part of an area called Woodberry Down, Manor House is now a small district without a formal town centre, but distant enough from other town centres that it has come to be referred to as an area. Taking its name from the Manor House Tavern (see below), via the Manor House tube station, it is centred at the junction of Seven Sisters Road and Green Lanes. The western border is defined by Finsbury Park in the neighbourhood of Harringay. Its other borders are defined by the New River, which loops around it on three sides. 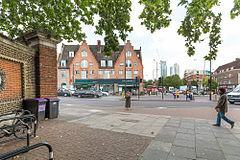 The area consists mainly of the Woodberry Down Estate, but there are also two small shopping areas, a school and a pub. Prior to any building development, the area was part of the demesne lands of Stoke Newington Manor. It was known as 'Berrie Down Wood' in the seventeenth century and 'Wood Berry Downs Meadow' a hundred years later. Building started on Green Lanes with the appearance in 1821 of a large house at a spot that would later be the site of the junction with Woodberry Down (the road). Further north on Green Lanes, just to the south of the New River, Northumberland House, a three-storeyed building with a pillared entrance, balustrade, and urns on its roof, was completed in 1822. It was sold for conversion to a 'private lunatic asylum' in 1826 It was then used as a private mental hospital until it was demolished in 1955. One of its most famous patients was Vivienne Haigh-Wood Eliot, first wife of the American poet T.S. Eliot, who lived at the hospital from 1938 until her death in 1947. A thatched cottage, with Gothic windows, was constructed on the boundary with the borough of Tottenham by 1825. Woodberry Down Cottages, four detached houses on the south side of Woodberry Down, had been built by 1829. Manor House tavern was built nearby in 1830. With the development of Finsbury Park almost a certainty, the land to the south and east of the present-day park was acquired by the Ecclesiastical Commissioners as ideal for building. The park was laid out between 1857 and 1869 and the adjacent land was sold to builders. During the 1860s, Thomas John Angell, who appears to have been a speculator rather than a builder, built Finsbury Park Villas. This was a terrace of at least twelve houses, which, starting with the Finsbury Park Tavern, ran northward along Green Lanes from its junction with the new Woodberry Grove. At around the same time, Angell and a London builder Thomas Oldis were responsible for development that began to spread eastward along the north side of Seven Sisters Road. From 1868 to 1870 large detached houses with gardens running down to the New River were built at the east end of Seven Sisters Road. In 1867 3 acres (12,000 m2) were leased on the southern side of the eastern end of the road, for the building of four detached or nine 'substantial' houses; three detached houses were built by 1871. An architect, William Reddall of Finsbury, was one of those who leased the houses. Woodberry Down was laid out in 1868, when it was extended eastward from Lordship Road, and villas were built on the south side in the late 1860s. The area was the northern section of a district called Brownswood Park (named after Brownswood Manor) and was regarded as a particularly select suburb. However, with the increasing suburbanisation of the area, mainly for the middle and lower middle classes, many of the original families had moved out by 1895 and others were being replaced by poorer people in 1913. Social decline continued, until in 1954 the district was inhabited mainly by students, foreigners, and the working class, with most houses containing four or five families and all in decay. From 1949 through to the 1970s much of the area was redeveloped, the old houses being demolished and replaced with a large council development known locally as Woodberry Down. The LCC compulsorily purchased the area for this purpose in 1934 in order to alleviate chronic housing shortages, but work did not begin till after the Second World War . Construction began in 1949 and the 57 blocks of flats were completed in 1962. Initially, the estate offered greatly improved living conditions for tenants. However, over time, the estate suffered the problems of comparably idealistic, post-war, social housing projects. By the late 1980s, many of the flats were in a poor state of repair, while many more were empty and boarded up with metal shutters. Throughout the 1980s and 1990s the increasing number of abandoned properties on the estate became occupied by a growing squatter community. The squatters at Woodberry Down Estate were predominantly young punks from all over the UK and Ireland. Several had squatted previously in the Noel Park area in Wood Green. The squatters’ relationship with tenants ranged from amicable to antagonistic, but the two communities generally managed to co-exist without too much hostility. The strong community spirit, which existed among residents in the 1950s was still evident to a lesser extent during this time, and the estate managed to avoid the more extreme crime and social problems often associated with inner-city housing projects. The sharp increase in numbers of squatters has clear links to the huge increases in homelessness in London that resulted from Thatcherite policies, such as the Right to Buy scheme (introduced in the Housing Act 1980). The tavern was the source of the name of the tube station and the immediate vicinity. The first tavern on the site was built by Stoke Newington builder Thomas Widdows between 1830 and 1834 next to the turnpike on Green Lanes. Prior to this date a cottage had existed on the site, but in 1829 an Act of Parliament was passed to permit the building of the Seven Sisters Road. Thomas Widdows was both the owner of the house and its occupant. With the building soon to be sited on the junction of the existing Green Lanes turnpike road and the new Seven Sisters Road, Widdows no doubt saw a roadside tavern as an excellent investment. The new building was within sight of the Hornsey Wood Tavern, which had been formed out of the old Copt Hall, the manor house of the Manor of Brownswood. It is possible that its name was taken from this connection The land itself however was on the demesne of Stoke Newington Manor. At around the time that the pub was first built, on the southern boundary of the demesne, on Church Street, a school called Manor School was operating The school was next door to the trading premises of Thomas Widdows, builder of the pub. So it is equally possible that the 'Manor House' name was just a fashionable name, more related to the connection with Stoke Newington Manor. Robert Baily, the first of many Manor House Tavern landlords described his establishment as a 'public house and tea-gardens' He placed the following advertisement in the Morning Advertiser on 30 June 1834. Baily died just three years later. 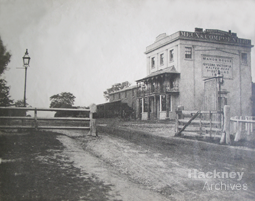 In 1838 the tavern was taken over by George Stacey who had previously been at the Adelaide Tavern in Hackney Road. The tavern changed hands again several times after Stacey. On 25 October 1843 Queen Victoria and Prince Albert 'visited' the pub when they were travelling by carriage from Windsor to Cambridge. The route included the still relatively new Seven Sisters Road and a stop was made at the Manor House Tavern for the first change of horses. A tablet with the following inscription was placed on the side of the pub. The above property has for years been recognised as one of the best in its class which is amply testified by the enormous and peculiarly profitable trade attached thereto; and in order that no misconception may arise as to the nature of the business, the auctioneers deem it wise to announce the tavern business and trade dinners have been discontinued for several years and the present returns are entirely confined to the counter and grounds from which sources they amount upwards are £5,000 pounds per annum. The building was bought by John Charles Kay who sold it two years later to Samuel Perrin  A further change of ownership in 1878 saw the pub in the hands of Stephen Medcalf. In 1879 Morris Benjamin made an application to renew the music and dancing licence as the licensee. 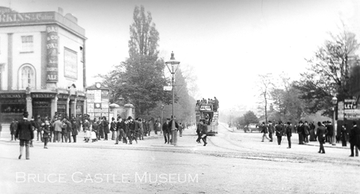 In 1890 it was taken on by James Swinyard who remodelled and modernised it shortly after the sale. Swinyard managed the pub till his death in 1910. Subsequently, his widow Amelia took over the licence until the late 1920s. In 1930 the imminent arrival of the Piccadilly Line led to the widening of the road, the demolition of the old tavern  and the erection of current building. Behind the new building, offices were built for London Transport To the chagrin of her sons, Amelia Swinyard sold the pub to a buyer who then received the compensation when the pub's land was taken to accommodate these buildings. Amelia died in October 1937, aged 90 at the Kenwood Nursing Home in Muswell Hill. In later years the pub was the first employer of Richard Desmond, now the owner of the Daily Express and Daily Star. The building also housed a nightclub that was popular among Goths in the mid-1980s. Two decades earlier it had functioned as a popular music venue for rhythm and blues enthusiasts, called the Bluesville R.& B. Club, hosting artists such as Cream, Georgie Fame and the Blue Flames, Long John Baldry and his Hoochie Coochie Men, Rod Stewart (then nicknamed 'Rod the Mod'), John Mayall's Bluesbreakers, the Jimi Hendrix Experience, Fairport Convention, Fleetwood Mac, Jeff Beck, the Spencer Davis Group, Graham Bond and Zoot Money. The ground floor of the building is now occupied by Evergreen supermarket and Simply Organique cafe. Since 2007, the Woodberry Down estate has been undergoing a phased redevelopment that is seeing modern flats built on the site, many of which are for sale rather than for social rent. The plan was initially conceived during a time of economic growth under the New Labour administration in the late 1990s. In 2002, a structural assessment concluded that 54% (31 out of 57 existing buildings) were beyond economic repair. To progress the redevelopment, Hackney Council struck a deal with Genesis Housing Association and Berkeley Homes for the estate’s demolition and redevelopment and urban regeneration project which has been amongst the largest in the UK. The first phase of the development produced 117 homes let by Genesis on social rents, and won the top prize for social housing at the Daily Telegraph British Homes Awards 2011. However, the redevelopment has been controversial, with some commentators calling the plans 'state sponsored gentrification'..
For details of education in this area see the London Boroughs of Hackney and Haringey articles. ^ Google map showing the rough boundaries of Manor House. ^ Roberts, Andrew. Northumberland House, The 1832 Madhouse Act and the Metropolitan Commission in Lunacy from 1832, Middlesex University, accessed 11 November 2009. Roberts cites Murphy, Elaine (2000) The Administration of Insanity in East London 1800-1870 PhD Thesis, University of London. ^ Seymour-Jones, Carole. Painted Shadow, Doubleday 2001. ^ Described as "Cottage and Garden. On the Eastern Side of the Green Lanes, opposite the Road leading to Hornsey Wood House" in the Schedule of the Act to amend an Act of the Seventh Year of His Present Majesty for Consolidating the Trusts of the Several Turnpike Roads in the Neighbourhood of the Metropolis, North of the River Thames, and to make and maintain Two New or Branch Road to communicate with the said Metropolis Road, pp 853-863 of The Statutes of the United Kingdom of Great Britain and Ireland, Volume 11, George Eyre and Andrew Strahan, Printers to the King's Most Excellent Majesty, 1829". The cottage was built c. 1810. No building is shown on map OSD 152 / Serial 104 Hampstead 1807 - 08 at Hackney Archives, but one does appear on the 1814 Map of the Parish and Prebendal Manor of the Parish of Stoke Newington, also at Hackney Archives. On Crutchley's 1829 map, the building is labelled as "Lodge", a term often used at the time to refer to a very respectable villa type dwelling. ^ This was certainly the belief of Edwardian author J. J. Sexby who wrote in his 1905 book, "In the neighbourhood of the (Finsbury) park we still have Brownswood Road and Manor-House Tavern to remind us of the Manor of Brownswood and of its manor-house, which has now disappeared" (The Municipal Gardens, and Open Spaces of London, Lieut. Col.J. J. Sexby, Elliot Stock 1905). ^ A History of the County of Middlesex: Volume 8, Islington and Stoke Newington Parishes, Victoria County History, London, 1985. Pages 143-151. ^ Morning Advertiser, 26 June 1837. ^ in November 1839 various newspapers carried the announcement of the bankruptcy of William Tombleson described as "late of the Manor-house tavern, Stoke Newington, tavern-keeper, publisher, dealer and chapman" (Wiltshire Independent - 28 November 1839). So it may well be that Tombleson took over the pub after Baily but didn't last long. ^ The Morning Advertiser of 31 July 1849 notes a change of licensee from Catherine Harris to William Burnell. Records also show a Michael Harris insured as a victualler at the tavern in 1840 (Nat Archives ref MS 11936/567/1323901); no doubt this is Catherine's husband. So it may well have been the Harrises who were running the pub at the time of the royal visit. ^ The Morning Advertiser of 2 July 1872. ^ Although the latter building still exists, Transport for London no longer occupies it. ^ Genesis scoops top social housing prize at Daily Telegraph awards, 29 September 2011. Retrieved 2011-09-30.